So last year for Merry Fluffy Christmas I won a package. Inside it was some Yarn from one company and a custom slot from Same Knit Different Dye. Although these longies haven't been worn yet. I have experience with her Knitting and I have to say it's beautiful. Do you know how hard it is to own a pair of knit longies like this for an ENTIRE YEAR before even using them? It was HARD! She also sent me the extra and I was able to get 2 baby hats out of it. 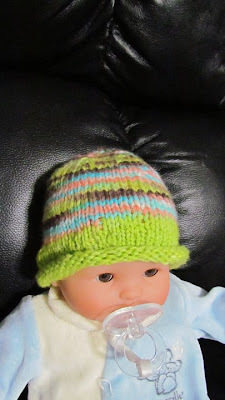 This one was too small and the other one should fit a newborn perfectly! That was my first in the round project!!! My I've come a long way! Anyway, the longies are GORGEOUS! The yarn is Laines Magnifiques Hoot on Royal Merino. The yarn is super soft, but her knitting is just flawless. 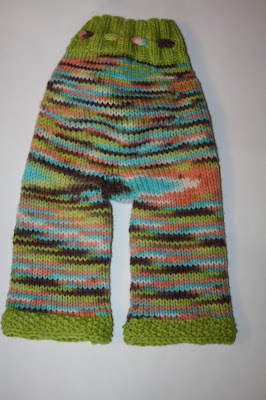 They are a size small which should be PERFECT for this baby for late winter/early spring. They do have a bit of pink in it, when I picked out my color it looked more orange, but I still think they're unisex and will look great on a boy! They'll be for around the house mostly anyway. Her knitting is flawless and I'm very happy to have this pair of professionally knit longies as opposed to all mine which are me made! Can't wait to FINALLY get to use them. Price: A Pair of Small longies are just about $50! It is worth it though. And wool is very high in demand. If they were kept up nicely and shaved and washed often you could easily resell them for $30! Overall: ***** on her knitting! Merry Fluffy Christmas is December 1st-5th this year and there is ONE package per blog! So lots of goodies. 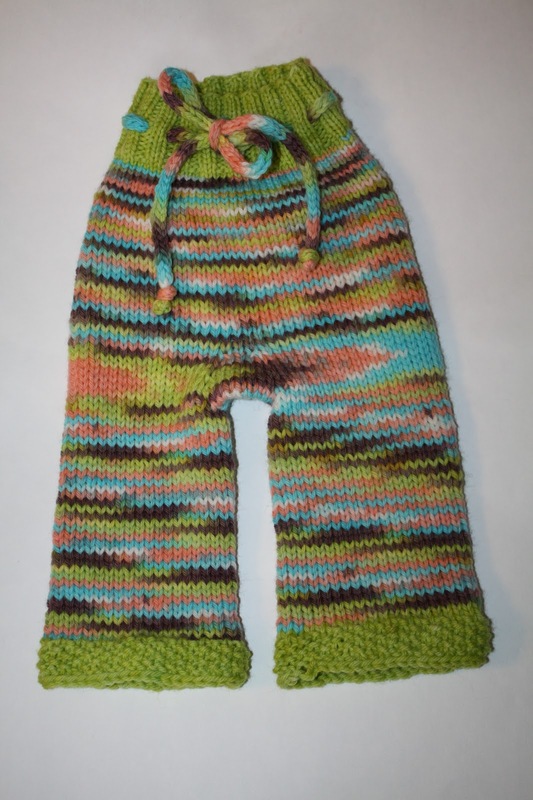 For MFC Same Knit Different Dye has offered a YYMN (Your Yarn My Needle) Custom slot for shorties or Longies $50. You need to send in your own yarn though which you can buy at Joann's!